We inform you that on Friday, 3rd April, on the occasion of the celebration of Good Friday, the Mercat de Flor i Planta Ornamental de Catalunya will remain closed. Otherwise, Easter Monday 6th April, it’s also holiday on Catalunya, but the Mercat will be opened extraordinaryly in reduced schedule, from 9 to 13 hours. Monday 30th March: From 9 to 13 and 15 to 17 hours. Wednesday, 1st April: From 9 to 13 and 15 to 17 hours. 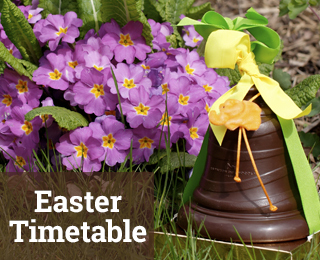 Monday 6th April (Easter Monday): SPECIAL MARKET from 9 to 13 hours. 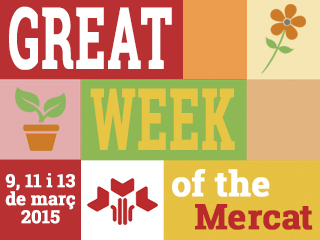 Next 9th, 11th and 13th March the Mercat de Flor i Planta Ornamental de Catalunya starts the spring with a very special week: the Great Week of the Mercat. There will be three days to present the wide variety of flowers, plants and accessories that Mercat producers and wholesalers offer for the new season. We want to make it known to our customers so they can comfortably start shopping for these dates and order more for the following weeks. For this reason, the Mercat will open Monday, Wednesday and Friday from 8 to 17 hours without interruption, so you can come and go when it’s better for you to have the necessary time to acquire the entire genre you need. In addition, we have provided a free service restaurant so no one has to hurry to leave lunchtime. What makes Great Week more attractive is the set of parallel activities and promotions that are planned. With the aim to give ideas to the florists, will be held three flower shows with two of the best catalan florists and a renowned French florist: Eduard Maynegra, Sergi González and Didier Gilles. Great Week will also be the time to ‘reopen’ the Mercat, that has taken the winter months to renovate the Direct Selling Hall with improved natural lighting and security measures. A great opportunity to enjoy everything it offers the Mercat de Flor i Planta de Vilassar .